Plant a bit of Sun(flower) Today! Hurry, now is the time to plant the most cheerful, uplifting summery annual of all …the majestic Sunflower! It grows in just about any type of soil as long as it gets lots of sun and water. Children love to plant the seeds and marvel at how fast the seedlings grow. Choose a sunny spot in your garden where the plants have a chance to grow to their full 6 feet plus height unobstructed. Water regularly 3 times a week and fertilize monthly with Dr. Earth All Purpose Fertilizer. 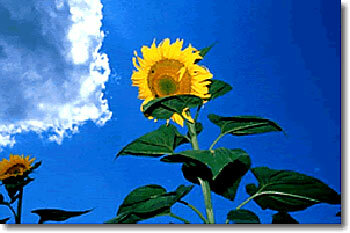 In order to have sunflowers blooming continually throughout the season, plant seeds or seedlings every 3 to 4 weeks. The all time favorite is the Mammoth Grey Stripe Sunflower that has a head almost a foot or more across in diameter. Harvest the dried seed head and shake the seeds out for future planting or roast the seeds on a baking sheet in the oven for about 10-15 minutes at 350deg F for a yummy, nutritious snack. Or place the seed head in the garden and watch the birds enjoy a spectacular feast. Smaller varieties such as Teddy Bear or Autumn Beauty are great for cut flowers to grace your tables throughout the summer and fall. Don’t let this summer go by without planting a sunflower…they’re great planted in containers for those with space limitations. Seeds start as low as $1.50 per package, a small price to pay for a season of sunny beauty and hours of gardening fun!